It’s been a rocky week, Chez Emma. The end of summer usually gets me in the mood for new beginnings and back to school Members Only jackets in colors like Spice Bush and Brownage, but I can’t seem to grab on quite yet. Maybe it’s because most of the country is in the grip of a very still-summer heat wave or because, as usual, the San Francisco weather is passive aggressively kicking off my days with a blanket of grey clouds. There’s never anything cozy about the grey weather here. It doesn’t drizzle and it rarely rains, so you’ve no excuse to curl up with tea and Cary Grant. Here, the greyness just pouts like a spoiled child who is neither charming nor cute but controls the room through sheer force of ill will. When it arrives, the autumn feels to me the way I imagine the New Year should: full of anticipation and excitement with the shiver of new opportunities in the air. At the beginning of January, I’m either hungover from Christmas or on the road, and I spend New Year’s Day making the obligatory lists of resolutions without the motivation to do anything about resolving them. Who wants to go to the gym or climb Mount Everest in January? No one, that’s who. Maybe if my resolutions were something wintery and within reach, like, “Get a kitten,” or, “Have some cocoa,” I’d get off my duff and get to it, but I’m too overachiever-y to pull up with something like that. 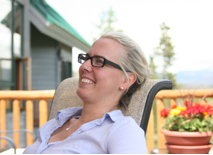 I end up setting goals that are either way too broad or way too specific, like, “Win a Pulitzer,” and “Don’t forget to call Nicole.” Sometimes, I throw in a vacation destination or two, just for good measure. Clearly, in the wetness of midwinter, I’m in no mood to step back and take aim at my future. Last January, I tried something new. I labeled a set of vases and a champagne cooler with different categories – Job, Travel, Wedding and so on – and R and I wrote down individual goals on Post Its and dropped them in the appropriate container. My thought was we’d get all the stuff we wanted to accomplish out of our heads and into the world and after a couple of weeks, we’d have a few drinks and pick a couple reasonable ones from each category for 2009. That two-step process was clearly too much for us. 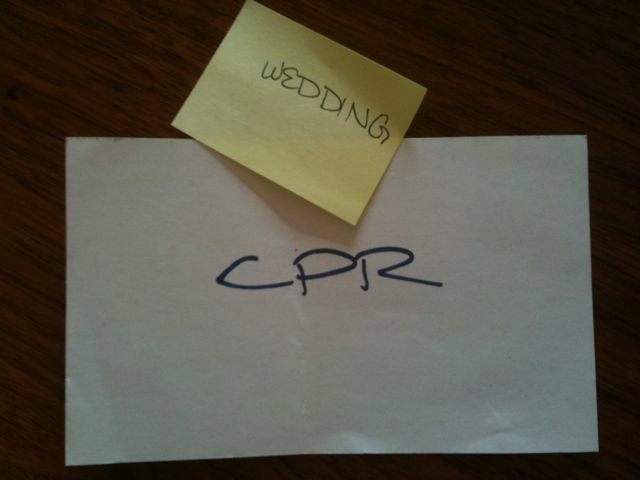 I sorted the contents of the vases about a month ago and found a Post It in the Wedding bunch that said “CPR” in R’s handwriting. Either he was being sarcastic or he’s got some ideas about what’s going to go on at our wedding that need to be discussed. When I was about twelve, I figured out how to handle Lent, that next season of promises made and often unkept. The Catholics had abstention all sewn up with their fasting and fish, but we Episcopalians weren’t all up in the ritualized self-denial, leaving me to come up with something original to deny myself. There was candy, but that was crap because who can give up candy? Ice cream likewise. Beating on your sibling was frowned upon year round. What was left that was possible without requiring an inconvenient amount of suffering and self-denial? I must have been in about sixth or seventh grade when I thought of the ideal solution: aim for something that was pretty well under my belt already, like giving up yellow mustard or heroin. Foodstuffs were low-hanging fruit since I could include things I already didn’t eat and things I’d rather not continue to eat: fruitcake, mushrooms, pudding, anchovies. I’d struck on what the self-help and team management books proselytize: specific, measurable, achievable, relevant and time-based goals (or SMART goals, for short). The relevancy might have been a little lacking, but I had the rest of them down. The winter months clearly aren’t the right time of year for me to stiffen my spine and get down to business, so September has become my January. Right now, though, there’s too much on my autumn list, too many things waiting to get sorted when the crisp fall weather rolls in in a few weeks. What I need to buckle down to is somewhere between Everest and yellow mustard, a few – maybe three – things I can sink my teeth into as we roll through the end of 2009. If I can get there, I can kick off 2010 with a sense of achievement and maybe a kitten. Finish Draft 1 of my new play. Sort out the renter’s insurance. Double traffic to my site. Settle on a date, location and budget for our wedding. Get a new cleaning girl. Drop usage of the word “like” to a level I can tolerate when I hear myself on tape. That sounds do-able, right? Four months? Sure. Although you’re right: the renter’s insurance thing is pretty complicated. OK. I’ll go for 2, 4 and 6, with a side dish of 7. Global peace is a Christmasy thing anyway. Hello there! You do not have to post this comment, but this is some of my favorite kind of writing from you. Whatever this genre is, I love it. You always make me smile/laugh/think. Love it.